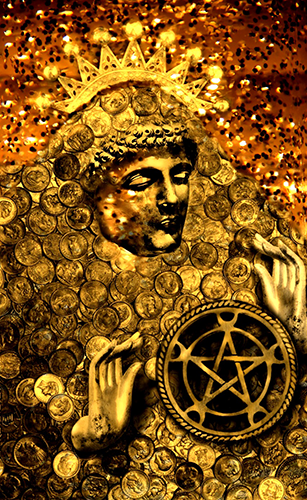 The King of Pentacles is all about business and money yet also possesses the grounded and earthly qualities to get what he wants. So what is it that you want? Today looks to be a day about sitting down and calibrating what will work best for you in relation to sorting out your finances or making some money. The delicate hands that seem to be coming from nowhere within the image are all ready to turn into motion a plan that will see more wealth come your way. Although wealth does not necessarily need to be about money or finances the King of Pentacles does imply that it is or that it gives you the necessary skills and attributes to make money, hold onto it and watch it grow. Look at the hands again. There are patterns on the Mount of Pluto slightly rolling into the Mount of Luna which implies that not only is this a good day for finances but that there is a shift that will come through you intuitive side in what you possibly need to change in your life to make this happen. Pentacles are usually about being grounded and taking practical steps but as the hands are so prominently featured then palmistry is also coming into play. These hands are not earthy… they are more in line with a water sign’s disposition as can be seen from the long fingers. They imply there is a certain flair for creativity and intuition to flow through the money making process and that even though you may feel bogged down and trapped by holding onto what you have you are more than willing to set the wheel in motion to branch out in different directions. Change, transformation and growth are all featured highly in this card and these things may come about in the most unexpected of ways. The odds are stacked in your favour and nothing seems to be coming between you and your goals today. If you were a betting person how many times would you need to toss a gold coin and have it land heads up? Chances are it would land that way 50:50 but not today… the odds are stacked in your favour that it lands heads up 95% of the time. Don’t believe me? Then count the number of coins that have landed heads up in this image. The card used for today’s Tarotscope — King of Pentacles — comes from the beautiful Tarot Maximo, self-published by the talented and prolific tarot artist Anthony Max. While this deck appears to be out of print, you may be able to enquire as to its availability through the artist’s Rabid Eyes Etsy storefront. Be sure to check out more of Anthony’s work through the No Regrets Tattoo Emporium Facebook Fan Page. Used by generous permission.